Short hair, long hair, bad hair day, a special event; we have so many reasons for you to use hair accessories to enhance or tame your hair. Often though, you may do nothing to your hair because you are concerned it will not look right or you don’t have enough time and you lack the talent for hair beautification. These excuses should be stopped! You, too, can have fabulously styled hair! All you need is a little time to practice using your creativity and have a collection of classic, kitschy, or trendy hair accessories. Hair clips can be used on long and short hair, and even hair extensions. All clips are not the same. For instance, there are hair accessories with alligator clip clasps. These allow you to enclose a large amount of hair by opening the over-sized clip and closing it when you have your hair captured, enabling you to secure it to the back of your head. This is useful to keep your hair away from your face and off your neck in warmer weather. Smaller clips normally come in pairs, and are used to adorn the sides of your head, pulling back a wayward bang, or just keeping your hair off your face. Wear just one, one on each side of the head or both on the same side. Use your imagination, while having fun with your hair clips. Entwine them with ribbons, or pin half your hair up with plain bobby pins then add your hair accessories to cover the pins. Hair half up and half down, whether side to side or front to back, is stylish and always in fashion. Because alligator clips hold so securely, they are popular hair accessories for babies and girls, normally because of their fine or thinner hair. The color range and style for younger wearers is extensive; pinks, blues and corals to name a few, but let’s not forget about the polka dotted elephants and other truly adorable options. Also available are shapes such as flowers, bows and ducks and many are adorned with a variety of ribbons, to make your little one feel as pretty as a princess! Barrettes are a timeless and lovely hair accessory. 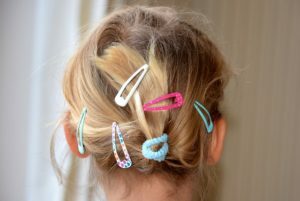 So many things can be done using barrettes to accentuate your hair. One style for using a barrette is to pull a small but equal amount of your longer hair from both sides of your face and clip it at the back of your head. Another classic style is pulling your hair back to the nape of your neck and then securing it with a barrette. One of the most romantic ways to wear your hair is to form two loose braids and use bobby pins to secure them to the back of your nape, now and the barrette, placing it on the makeshift bun, adding style and grace. Two barrettes that would work well with that charming style is the horizontal rose gold-toned or silver-toned French barrette or the flower shaped rose gold tone or silver-toned French barrette. Both styles have the same purpose and functionality but are very different, yet equally gorgeous. Your hair will look magnificent, like something out of a fairy tale or a fashion magazine! Barrettes are also a terrific kids’ hair accessory. They keep hair in place and out of their faces while having fun with friends, so remember to bobby pin their hair securely here. Popular for both girls and many women are hair bands. Hair bands are found in soft material that will completely encircle the head and hard plastic that is used to push hair back off the face and lodge behind the ears. A hair band is also a great idea to wear while exercising, to keep those sweaty strands out of your eyes. The amazingly versatile hair bands can be used for everything! From casual to formal functions, the headband has you covered. Toddlers and little girls have selections of flowers, hearts, and small ribbons and all are available in a huge array of colours. Older girls and teens have many choices but, the most trendy are the Sparkle Street hair bands with buckles and large coloured stones. Older teens and young women require a little more from their fashion hair accessories, so it’s easy to find both style bands with faux jewels across the entire top or off to the side and even in a floral design highlighted with faux diamonds and gemstones. The importance of the faux jewelry is that it brings additional shine and glamour to your hair while adding dimension. The availability of the hair band styles is too large to enumerate, it simply must be seen! Feel free to browse at Myntra.com to see first hand the wide variety available. Smart styling your hair with fashion accessories is easy once you get a feel for the look you are striving for. We recommend you take two of the same hair band and place them on the top of your head with a slight gap in between. Voila, instant glamour! Now to change that look up, take a clip with a flower or a bow on it and secure it to one or both hair bands. Please remember to just accent one side of your head though: accenting both sides will take away from the look. Make sure you have pinned the clip in securely with bobby pins as well. What you are doing here is being creative with a few lovely hair accessories to have a look no one else is going to have. Here comes the bride, this is your big day. You found the perfect man, dress, shoes etc., but how on earth are you going to do your hair? 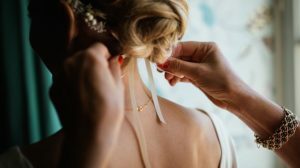 Okay, maybe you will go to the newest salon to get the perfect coiffure, but you still need to have the most outstanding bridal hair accessories. Deciding what is going to complement your hair and dress should be pretty easy (after all, you’ve made all those BIG decisions!) Many brides choose the multi-coloured jewel-toned hair clip, using it to pull their hair back from the face in a very pretty, yet simple style. Others adorn diamond-like hair bands or use decorative bobby pins of which there are many styles, and there are assorted combs to provide additional glamour. May we again suggest something unique on this most special of days, but something that is also elegant. Imagine your hair in an up do of sorts with both hair clips, or barrettes enhanced bobby pins or one or two lovely hair combs. It’s something that will reflect your personal, elegant, tasteful style. Looking as lovely as possible on this once in a lifetime day is easy. Just remember to take your time and talk with friends and professional stylists to determine the perfect accessories to make your hair beautiful. Remember for short hair, long hair or even hair extensions, stylish hair accessories are perfect for almost any occasion.